Frederick Henry, a 30-year U.S. Army veteran and former chief of staff at the Defense Information Systems Agency, has joined Unisys (NYSE: UIS) to lead the information technology company’s work with DISA. Unisys said Tuesday that Henry will oversee a portfolio of cybersecurity, application modernization, data center and infrastructure service offerings designed for DISA and report directly to Jennifer Napper, vice president of the Defense Department and intelligence group at Unisys’ federal business. 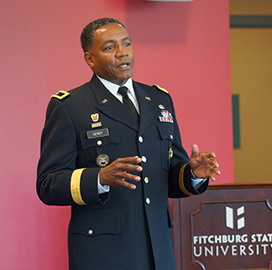 Before he became DISA’s chief of staff in 2012, Henry served as deputy commander at the U.S. Army Network Enterprise Technology Command for two years. The retired brigadier general also serves as vice president for cyber outreach initiatives of the Association of the U.S. Army’s George Washington Chapter and is a member of the Information Systems Audit and Control Association and the Armed Forces Communications and Electronics Association. Henry also supports educational programs aimed at developing the science, technology, engineering and math skills of disadvantaged students.